When one thinks of Italian food it is often of pasta, but don’t forget risotto. Risotto is versatile to use to welcome many flavors and produce, like ramps. While they’re in season, let’s eat all the asparagus we can, starting with this creamy asparagus risotto. Shrimp asparagus risotto: Creamy, saffron infused risotto, asparagus, shrimp, and parmesan cheese. Not a traditional recipe, but produces delicious results. Instant polenta is quickly made and served with goat cheese and sun-dried tomatoes alongside grilled asparagus and pesto-brushed flank steak. Easy and delicious. Spring is a wonderful time of the year to enjoy this beautiful asparagus with lemon and garlic Recipe. A simple, quick Italian side dish. Ready in 10 minutes. Grilled Asparagus With Dijon Mustard Vinaigrette – easy springtime recipe, ready in 30 minutes. It’s always exciting to create pesto in different ways. This recipe is for a spring inspired pesto for your pasta. 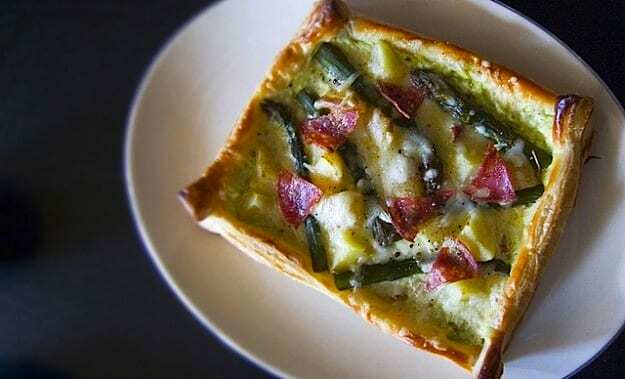 Try it out topped with asparagus! Roasted asparagus and radishes with a mint-pea pesto is a beautiful way to highlight spring produce. This simple side dish is sure to impress. Pretty toasts are great for a spring party or Sunday brunch. Don’t forget the lemon zest to add a burst of freshness to the creamy and rich appetizer. Oven-cooked salmon with a ton of flavor and color. Serve over a bed of quinoa for a complete fish and vegetable bowl. Grab herbs, garlic, and a lemon to create the simple, but delicious garnish. Try it atop asparagus and add it to your fish, meat, and cheeses, too. This tangy, sweet, bright spring salad with strawberries and asparagus is a perfect side with cheese and crusty bread. Check out the B.T.C Cookbook for a great read and more delicious recipes. Asparagus and toasted hazelnuts served with an egg and bacon is a great breakfast or lunch, drizzled with a mustard vinaigrette. If you can’t find yellow rock candy just use caster sugar and defrosted frozen prawns will work in place of fresh ones. You can serve these asparagus hot or cold, alongside dinner or with eggs for brunch. These muffins make a lovely light lunch or dinner when served with a poached egg and taste perfect with a glass of wine. This pasta with boiled and sauted asparagus and sun-dried chili makes for a flavorful side or main dish. A beautiful tart that looks so sophisticated and takes so little time to put together. Let’s remember that a good risotto doesn’t demand a lot! It just needs your constant presence, your time and fresh ingredients. You have to like asparagus if you are in Italy in the spring. There is no escaping the spears, they are in every mercato, every supermarket, on every menu. You can serve the sauce on the side, and dip individual spears into it, or toss the spears with the sauce and serve, topped with additional egg whites. Try this amazingly creamy asparagus soup, courtesy of Lauren Hardy. The warm weather finally broke last week and with it came asparagus! A spinach salad with a light dressing, plenty of veggies and with the addition of fresh sliced oranges.